Blessings tend to make life’s imperfections dissipate like a cloud of smoke. That is, if you let them, if you focus on them, if you realize you’re blessed. If not, you’ll end up like most people, trapped in the smoky thickness with bloodshot eyes, probably coughing and complaining, your vision clouded, lacking sufficient depth and perspective. When all you see are life’s imperfections, your only desire to escape from problems that will always exist, it’s kind of ironic that you can’t escape. It’d be easy for Golden State Warriors star Stephen Curry to be blinded. It’d be easy for his on-the-court woes to affect every aspect of his life, every facet of his happiness. The No. 7 pick in the 2009 NBA Draft didn’t pan out the way Warrior fans hoped last season, when he missed 40 of 66 contests and his final 27 games because of a right ankle injury. It was by far the most frustrating season of his basketball career, high school and college included. After only missing two games his rookie season (17.5 points per game) and eight games in 2010 (18.6 point per game), Curry was living up to the hype swarming around him out of Davidson College, where he led the Wildcats to a magical Elite Eight appearance and their first NCAA tournament victory since 1969. He was shaping up to be Golden State’s savior as well, a struggling franchise that has only been to the playoffs once in the last 17 years. But the Warriors backslid last year, undoubtedly affected by Curry’s injury, and finished with an abysmal 23-43 record with Curry only averaging 14.7 points per game. Meanwhile, the daunting question weighs in the minds of Warrior fans: Will their star’s ankle ever be the same? He had offseason surgery after missing eight games in 2011, and had another surgery after missing 61 percent of his games in 2012, a surgery that required 3-4 months of intensive rehab. Many argue it’s an injury that won’t go away—no matter how much rehab, no matter how many surgeries—especially after he injured it again against Portland on Oct. 19 this preseason. He returned for the start of the regular season—an 87-85 victory over the Suns, the same day the Warriors extended his contract by four years and $44 million—but Warrior fans can’t help but wonder: How long will he last? Ayesha Curry wonders how he does it—how he comes home every day, the weight of Warrior basketball redemption on his shoulders, the frustration of ankle injury after ankle injury, surgery after surgery, rehab after rehab, and doesn’t bring any of it into the household. None. His wife of a year and a half—who he met at the age of 15 in youth group at Central Church of God in Charlotte, N.C. (where they also married on July 30, 2011)—says it’s because he’s steady. Some think he’s emotionless—his monotone voice prevalent in interviews (unless you get him talking about golf, Charlotte, or Christian rapper Trip Lee)—but he’s really just steady. “Stephen,” she’ll say to him. “I’ve never heard you complain about anything.” She says it’s something she tells him rather frequently. “He’s had a pretty rough year and a half when it comes to his ankle injuries,” Ayesha says. “But there has never been a day that he has had a frown on his face…It’s to the point where I’m in awe and shock. How do you not bring all of that stress home with you? He comes home with a smile on his face and happy. I appreciate it. And that’s Stephen Curry. The smoke—his trials—it dissipates around him because the penetrating air—his reality—is too encouraging to cloud his vision. The fact that Stephen Curry delivered his own child in the hospital has to say something about him: He’s going to be there. He’s going to be there no matter what. Though on-the-court turmoil has defined his basketball career the last year and a half, off-the-court joy has defined his personal life. And it hasn’t been at all what he expected. At all. July 30, 2011: Ayesha and Stephen marry. Soon after, 2011: They move their belongings from Charlotte to California. November, 2011: Three months into marriage, they discover Ayesha is pregnant. July 19, 2012: Their baby daughter, Riley, is born. Stephen becomes a father at 23. Ayesha becomes a mother at 22. “It’s been a whirlwind,” Stephen laughs. “I had to grow up, for sure…We wanted kids, but we didn’t think it would happen in our first three months of marriage,” he continues laughing. It’s in the context of his family that you grasp the depth of Stephen’s personality—his desire to be a leader and carry his family in the right direction, his passion for his faith. Stephen embraces leadership both on-the-court and off-the-court. He feels a calling to, not only lead his family, but also go against the grain in the NBA, where players can potentially carouse and sleep with whomever. They are the most recognizable athletes on the planet, and they can do whatever they want, for the most part. The world is at their fingertips. “I’m in a different demographic than most of the players and most of my teammates,” Stephen says. “Totally different situation. Different priorities. Different interests. Me, personally, battling being a part of the team and not being the odd ball out—that’s the hardest thing to balance. My priority is to be a man and child of God and not get sucked into the temptations a lot of guys don’t have a problem getting into. Family definitely helps me in that regard because if my faith carries them and they’re happy, I know I’m doing the right thing. “It’s very humbling to know I’m able to be on the stage that I am, and I think God has put me in this situation to change this perspective on what it is to be a man of God and a player in the NBA. I want to use the gifts God gave me on the basketball court to uplift His name. That’s at the forefront of why I play the game. A week or two ago, Ayesha sent Stephen a text while he was on the road. It was Ephesians 3:20: Always giving thanks to God the Father for everything, in the name of our Lord Jesus Christ. And somehow, that sums up the last 18 months perfectly. Stephen Copeland is a staff writer at Sports Spectrum magazine. 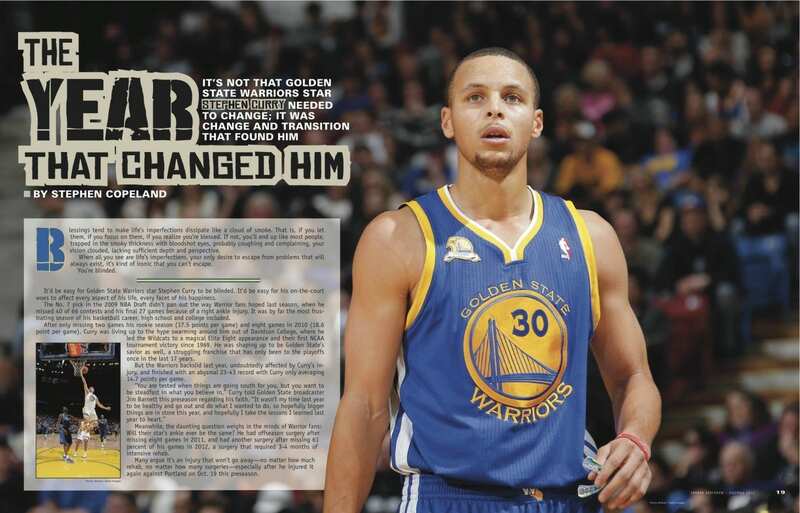 This story was published in the All-Basketball, October 2012 DigiMag.